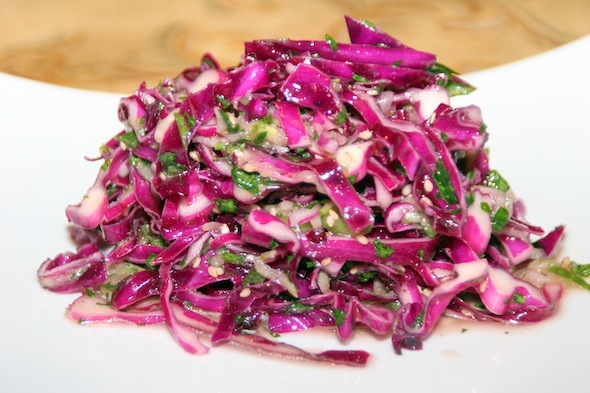 This Asian inspired refreshing cabbage slaw will satisfy your craving for tang and crunch. Toss cabbage, onion, cucumber, parsley and sesame seeds in a very large mixing bowl. Add olive oil, rice wine vinegar, salt and pepper and mix well. Cover and refrigerate at least 30 minutes and up to 2 hours. * Shred cucumbers in a food processor using shredding disk for best results. *Slaw may be prepared one day ahead, cabbage texture will be softer. Drain excess liquid if necessary.